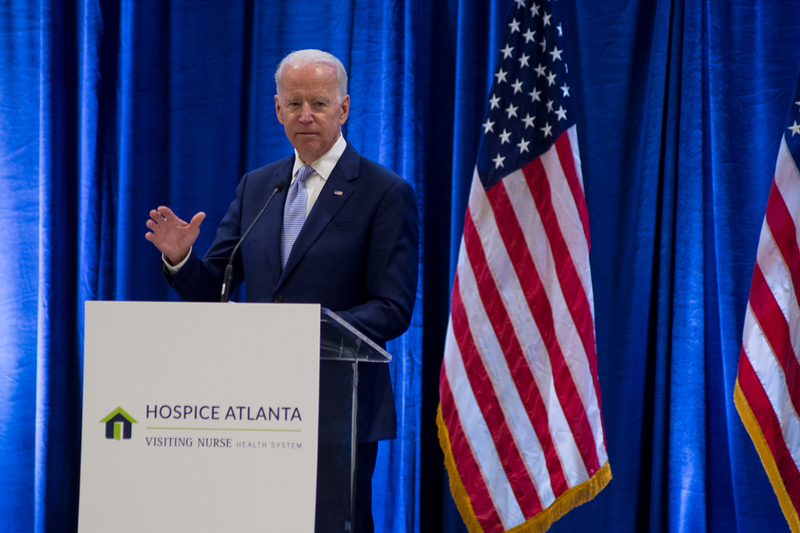 Joe Biden speaks at the Hospice Atlanta luncheon on Thursday. The amount of loss former vice president Joseph Biden has had to endure over his lifetime is staggering. In 1972, just weeks after Biden was elected to the U.S. Senate for the first time, his young wife, Neilia, and their 13-month-old daughter, Naomi, were killed in a car accident. Their two sons, Beau and Hunter, were gravely injured. Biden took his oath of office from their hospital room. In 2015, Beau Biden died of brain cancer. He was 46. As Joe Biden remarked Thursday, his family members have been the beneficiaries of hospice care “more than I’d like to acknowledge.” Beyond the care nurses gave Beau in his final days, Biden’s own parents, as well as his wife Jill’s, were also in hospice care before they passed. “Simply put, you all do God’s work,” Biden said, addressing the nurses among the crowd gathered for the 70th anniversary of the Visiting Nurse Health System, which provides in-home medical and palliative care throughout metro Atlanta. Hospice Atlanta is part of Visiting Nurse, providing end-of-life care to patients at home and also at the Andrew and Eula Carlos Hospice Atlanta Center in Brookhaven. Hospice Atlanta also runs Camp STARS, a bereavement camp for families who’ve lost a loved one. Last year the organization provided more than $3.5 million in unreimbursed medical care for patients. Thursday’s benefit luncheon was for Hospice Atlanta, and Biden attended at the urging of his friend, Senator Johnny Isakson. Although Beau Biden’s battle with brain cancer represented the Biden family’s most recent interaction with hospice care—and was the subject of Biden’s 2017 book Promise Me, Dad: A Year of Hope, Hardship, and Purpose—the vice president also discussed the vital role hospice played in the deaths of his own parents, both of whom died at his home in Delaware, his father in 2002 and his mother in 2010. Biden recalled the day a nurse came to him with a message: His father wished to see him. As important as the comfort the nurses provided for the patients, Biden said, equally important was the reassurance they provided the family. Biden also plugged the Biden Cancer Initiative, launched last year to encourage more communication among researchers and doctors, and to marshal the various disciplines in a way to attack cancer in a more concerted way. “We’re trying to create a health care system that people think we already have. We should be able to say the affordability of cancer treatment is getting better, not worse. We can’t say that. We should be able to say that there’s widespread sharing of research data, and that medical records are easier and cheaper to get and share with researchers, but we can’t. Visiting Nurse Health System will host a fall fundraiser on October 6 at the Georgia Aquarium. For sponsorship and ticket information, call Dabney Hollis at 404-215-6011.